The Peer Support program utilizes trained Peer Support Workers to provide mentoring and goal-oriented support to their peers through a variety of settings in the Fraser North region. The program provides direct service to residents of the Cypress, Connolly and Cottonwood Lodges in both one-on-one and group settings. The Lodges are tertiary settings nestled in the grounds of Riverview Hospital. One-on-one and group support is delivered in acute settings at Ridge Meadows Hospital, Royal Columbian Hospital and Burnaby General Hospital. In the community, we deliver one-on-one supports that focus on individual goal exploration, development and achievement. In addition, extra hours are allocated at Clubhouses in all our communities. 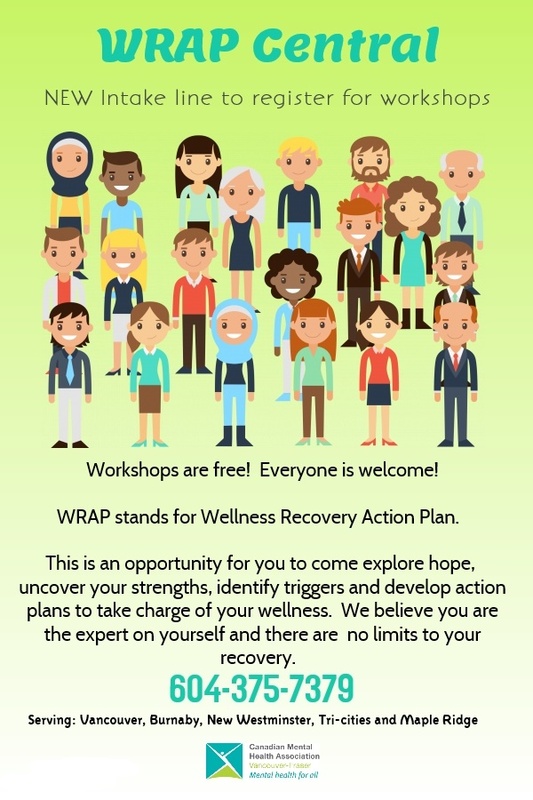 Peer Support Workers co-facilitate Recovery Support Training (RST) and Wellness Recovery Action Plan (WRAP) groups in different communities in the Fraser North region throughout the year. Please see below for information about each group and how to get connected! 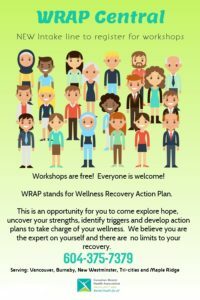 WRAP (Wellness Recovery Action Plan) Central is an intake line for individuals and service providers to call, in order to find out information about upcoming WRAP workshops in the Lower Mainland. WRAP Central aims to provide centralized and consistent information through one phone number, so that callers are able to access a group near them with ease. In addition, WRAP Central encourages service providers to call so that they are aware of WRAP workshops happening near them.